[After the band of the Grenadier Guards had played an Elektra potpourri] His Majesty does not know what the Band has just played, but it is never to be played again. - King George V, quoted in Reid, Thomas Beecham, 1961. If Richard Strauss' third opera, Salome, established his international reputation the completion of Elektra suggested a composer who was on the brink of breaking the mould of opera (although this was not to be, as his next opera Der Rosenkavalier demonstrated). Elektra comprises an immense, dissonant score and one of the most demanding parts ever written for the female voice, with Elektra never off stage after her first appearance. It shocks as few operas do, and weaves orchestration of great complexity with vocal writing of thrilling power. Elektra has not often been recorded in the studio, undoubted masterpiece that it is, but we are fortunate to have a number of great recordings taken from 'live' broadcasts. The aim of this survey is to guide the listener through the recordings that are currently on the market and offer a final recommendation, or two. Synopsis. Using a libretto by the Austrian poet, Hugo von Hofmannsthal, the story of Elektra is based on the play Electra by the Greek tragedian Sophocles. The opera starts with Klytemnestra's maids washing away the blood of her murdered husband, Agamemnon, from the palace walls. Elektra appears and is derided by the maids. In her first monologue, "Allein! Weh ganz allein", Elektra invokes the spirit of her father and celebrates the day when his murder will be avenged. Her sister, Chrysothemis, still living within the palace walls, informs Elektra that Klytemnestra and her lover, Aegisth, are planning to immure her in the tower where they hope she will die. Elektra rejects these words, when noises are heard from within the palace proclaiming a sacrificial procession. Chrysothemis explains that their mother has suffered terrible nightmares, and in a move to exorcise them she plans a bloody sacrifice. At this stage Elektra determines to confront her mother and lures her out of the palace walls. In "Was willst du? Seht doch dort", Klytemnestra pleads with Elektra to help rid her of the nightmares that are now ravaging her body and mind. Elektra replies enigmatically that the sacrifice must be Klytemnestra herself if she is to be freed from the nightmares. Elektra then asks her mother about her brother, Orest. Klytemnestra lies and tells Elektra that his years in the wilderness have made him mad, a lie which leads the smoldering bitterness between the two women to erupt into hatred. Elektra tells her mother that she will be hounded to death and Klytemnestra retorts that Elektra herself will receive the severest of punishments. Klytemnestra returns to the palace walls, when Chrysothemis arrives with news of two strangers who have testified to Orest's death. Elektra, crushed by this news, decides she will avenge her father's death herself. Chrysothemis, dismayed by this, flees in terror. Elektra looks for the axe with which her father was killed and comes upon a stranger she soon recognises as her brother, Orest! Orest!. Angered at his duplicity, Elektra refuses his embraces. Orest leaves her and enters the palace, whereupon she hears the screams of her mother and later those of Aegisth. Orest is proclaimed by the people as their savior as the palace walls drip with blood. Chrysothemis invites her sister to join in the celebrations but Elektra, now scarcely aware of what is happening, escapes into her own closed world and at the climax of a joyous dance collapses lifeless to the ground. Chrysothemis appears and calls to Orest but the palace doors remain shut. The Music. The harmonic structure of Elektra owes a great deal to the tonal disintegration that started with Wagner (another composer for whom the leitmotif was an important functioning part of the infrastructure of an opera). But it is also an opera of contrasts: both theatrical and psychological, dissonant climaxes set against intense lyricism (Elektra's dance of death played out against the lyricism of the Recognition Scene between Elektra and Orest). All of this is achieved by building up huge blocks of sound and establishing tension between contrasting chords. The chords of B minor and F minor establish the Elektra theme and the D minor chord that comes to symbolise Agamemnon is set symmetrically against this. Later, when Orest returns, set against the chord of A-flat major, the symmetry becomes complete with the pattern of B-D-F-A-flat now established. 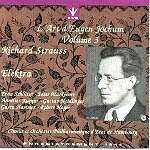 From the opening, brutal triad of Elektra it is clear that Strauss intended to explore his musical possibilities to their limit. The score, compact yet monumental, is one of the most violent in all opera and is composed of a series of multiple themes, all somehow interrelated to each other. Its complexity comes down to Strauss' ability to establish musical connections, at times hundreds of bars apart, of simple and repeating chord progressions. Such complexity underlines the drama of the opera and establishes Strauss as the natural successor to Wagner. 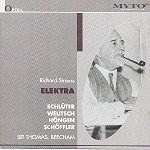 It is probably a mistake to view Elektra as a radical work that might have allowed Strauss to write a truly atonal masterpiece - as Schoenberg did progressing from Gurrelieder to Moses and Aaron. Strauss' next work, Der Rosenkavalier, shuffled off many of the coils of atonal development he might have pursued, and allowed him to produce probably the most Romantic work of the century. In a transparent performance of Elektra this development can clearly be seen. Like Verdi's La Traviata, Elektra is an opera that depends, entirely or otherwise, on the merits of the protagonist. Just as Violetta dominates Verdi's great opera, so Elektra carries that of Strauss: she must encompass a vast range of emotion with a voice that requires her to reach the depths of despair as well as the heights of ecstasy and histrionicism. For this reason, the best Elektras have often been great Wagnerians (although not exclusively). 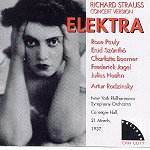 The earliest recording of the opera derives from a 1937 concert performance with Rose Pauly in the role of Elektra. Pauly was the most celebrated Elektra of the 1930s and all subsequent performances rest somewhat in the shadows of this titanic and electrifying interpretation. The voice is pure in the upper staves (important in this opera), and has marvellous power in reserve for her confrontation with Klytemnestra (a noble interpretation from Enid Szánthó). Pauly's singing at the climax of Klytemnestra's murder is unsurpassed on record - it truly terrifies as no other interpretation has since, and her ecstatic waltz has real power (as a performance it is unmatched). None of this would be possible without the other great protagonist in this opera - the conductor. Artur Rodzinsky was a superb Strauss conductor and he leads the New York Philharmonic through Strauss' complex score with magnificent aplomb. There are draw backs to this recording. Firstly, it is incomplete and heavily cut to allow for a concert performance. Secondly, the sound is at times very distorted, and at times very crackly, although the voices sound real and focused. It remains, however, an indispensable recording and is on Eklipse EKRCD17 at full-price. Ten years later, another great interpretation was put down on tape. Sir Thomas Beecham's 1947 recording with the Royal Philharmonic Orchestra has the advantage of very good sound and another interpreter of some stature, Erna Schlüter. Beecham had had a long association with this opera, conducting the British premier in 1910, the first Strauss opera to be performed in Britain. Beecham's mastery of the score is total - brass snarl like on few other recordings and listening to Klytemnestra's procession in Beecham's hands you might well think it could not be excelled so trenchant and possessed is the playing. Indeed, throughout this performance it is the orchestra that leaves the most indelible impression. Schlüter could be unsteady at the top of the treble stave, and this is evident in her confrontation with Klytemnestra, but what makes this interpretation so special is her nobility and beauty of expression. It is one of the most vivid performances on record. For sheer greatness, however, listen to Elisabeth Höngen (another superb Wagnerian) as Klytemnestra. She is unrivaled. The close of the opera is high voltage, Strauss' great chords brought down with absolute finality, Beecham at his most exciting. The recording is on Myto 981.H004, 2 CDs, at upper mid-price. A slightly earlier recording of Erna Schlüter in the title role comes from 1944. Conducted by Eugen Jochum and the Hamburg Philharmonic Orchestra, it is a very different interpretation from her one with Beecham. The voice is certainly more secure, partly driven by Jochum's luminous and agile conducting. And it is certainly darker and more austere than in her later recording. Jochum, a great conductor of Bruckner, builds Strauss' great blocks of sound into a sumptuous canvas, one that generates considerable fervor. Elektra's monologue, Was bluten muss?, literally stings, so compelling are Jochum and Schlüter. In the Recognition Scene, one of the most lyrical passages of the opera, Schlüter caresses her notes so that they equal the warmth of the Hamburg strings - a most beautiful effect. Schlüter is wonderful during the drama of Klytemnestra's murder, feverish and intense, Jochum producing climaxes of thunderous impact. Jochum's final waltz, whilst lacking the drama of Rodzinsky or Beecham, is played with considerable textural weight, the 1944 recording more than amplifying the passion of it all. When the final chords smash down the effect seems all the more moving. Jochum's recording is on Lys LYS255-256, volume 3 of its Eugen Jochum edition, at full price. Dmitri Mitropoulos was an inspirational conductor, particularly in Strauss whom he appears to have conducted with considerable insight. Any one of his three recordings could make a first choice in this opera. In two of them, he has as his Elektra probably the greatest exponent of the role in the latter half of the century, Inge Borkh. Mitropoulos was a consistent advocate of this opera, all three of his interpretations marked by his typically illuminating and penetrating treatment of the score. His 1951 recording, 'live' from Florence, has Anny Konetzni as Elektra. It is a beautiful reading of the role, and is complimented by a marvellous Klytemnestra from Martha Mödl, fully endowing her character with the riddled anxiety that haunts her last hours. It is on Fonit Cetra CD04 at bargain price, but is ultimately an appetizer for his New York and Salzburg recordings. The first Borkh/Mitropoulos Elektra comes from the 1957 Salzburg Festival. Mitropoulos' mastery of the score is totally evident, although this is a noticeably slower performance than his Florence recording. As a result, it is imbued with a power that eludes the earlier performance - rarely has the Recognition Scene appeared so dark, the Vienna Philharmonic producing glorious lower strings to highlight this. The effect is sumptuous, at once caressing the ears, only to be disturbed by the inexorable pungency of Mitropoulos' pacing of the great climaxes. This is first and foremost a commanding rendition of the score . Only Karajan and Carlos Kleiber match the pulse Mitropoulos sets. The effect is always breathtaking, and no orchestra (bar one) plays this music with such nobility and animation. Inge Borkh's Elektra is as complete as any, a consummate personality and sung with superb virtuosity. The recording appears at full price on Orfeo C 456 972 1. Less than a year later, Borkh sang Elektra again with Mitropoulos, this time at a concert performance with the New York Philharmonic in March 1958. The sound is not as focused as in Salzburg, but all of those characteristics that imbue Mitropoulos' Strauss are readily heard. Nevertheless, it remains firmly in the shadows of the great Salzburg reading. It appears on Arkadia MP 459.3 (coupled with a fine Salome) at bargain price. Inge Borkh makes two more appearances on disc as Elektra, one 'live' and one studio. The 'live' recording comes from a 1953 Frankfurt performance conducted by Kurt Schröder. It is marked by a truly overwhelming Recognition Scene which allows Borkh to colour her voice utterly uniquely. She never surpassed this, and the effect is so creamy as to remind one of the Trio of Der Rosenkavalier. However, Schröder is not an electrifying conductor and this performance fails to ignite as a great performance of Elektra should. It is on Golden Melodram GM 30007 at full price. Borkh's studio performance, however, is an entirely different matter. Conducted by Karl Böhm, this is the first stereo Elektra. It also has the Dresden Staatskapelle. Even more so than the Vienna Philharmonic, this orchestra totally understands Strauss' idiom: it premiered many of his works and plays with that unique sound only an orchestra who has worked with a composer can. It plays faultlessly, and Böhm's tempi, often very fast, add an excitement to the playing that makes the brass snarl and roar as on no other recording, the woodwind chatter and whisper incomparably and the strings dig in with tremendous depth. Under Böhm the opera has intense momentum, although it is never overplayed, and in many parts Böhm makes more of the great, sweeping Romantic melodies than conductors who are more measured in this opera. Inge Borkh is almost near perfect as Elektra, her singing, as only a true actress can, illuminating the hysteria, compassion, love and determination of her creation. Dietrich Fischer-Dieskau is a meltingly deep toned Orest (the Recognition Scene is magical) and more than copes with the strains of the extended range of Orest's music. All in all, a remarkable recording. It is at mid-price on Deutsche Grammophon 4453292. Another Salzburg recording offers a truly titanic reading of this opera. It is conducted by Herbert von Karajan. 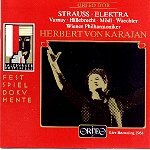 Karajan never recorded Elektra commercially, primarily because he found the work left him totally exhausted and emotionally drained (he found Mahler's Ninth, Sibelius' Fourth and Berg's Three Pieces for Orchestra similarly difficult). This recording is, therefore, a very important document by the finest Strauss conductor this century, and encapsulated in it is the Elektra of Astrid Varnay. She is miraculous in many ways: she has enormous reserves of vocal stamina and she understands the role perfectly. Iciness makes way for compassion, her outbursts have volcanic potency and savagery in the voice appears when needed. She is capable of the utmost tenderness in her luminous reading of the Recognition Scene. The Klytemnestra of Martha Mödl is tinged with greatness, whilst Eberhard Waechter's Orest is imbued with a beautifully deployed baritonal sonority. But it is to Karajan one returns. The Vienna Philharmonic plays with great beauty under him - but in turn produces outbursts of overwhelming drama. It is all so intense, but also so very transparent. Every note comes through Karajan's hands played with supreme balance and the effect is totally memorable. The recording appears on Orfeo C298 922 1, at full-price. 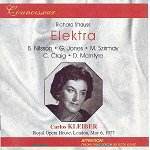 The most recent Elektra to appear on disc is Carlos Kleiber's legendary 1977 performance from Covent Garden (reviewed in May). This is a staggering, almost overwhelming vision, with Birgit Nilsson magnificent in the title role. Kleiber, like Karajan and Mitropoulos before him, takes a large-scale, symphonic view of Strauss' score - and the results are towering. As one would expect of a conductor who has performed Der Rosenkavalier so many times, Kleiber does not see Elektra exclusively as a dissonant work - there is much beauty in Kleiber's handling of the darker, more lyrical passages that pre-empts Strauss' most Romantic opera. Two discs from House of Opera offer the prospect of fascinating performances. The first is of Christian Thielmann's Covent Garden Elektra from 1997. I remember this as a superlative performance, which showed a young German conductor prepared to look back to the great Strauss traditions of Karajan and Böhm. Böhm is the conductor in a 1975 Paris performance that has Nilsson, Rysanek, Varnay and Hans Sotin amongst its cast. Wonders indeed! I hope to review both of these discs in the near future. Two studio performances deserve mention. Recorded more than 30 years apart, the Elektras of Georg Solti and Guiseppe Sinopoli are both thrilling readings. Solti's recording (see review and technical appraisal), long considered one of the gramophone's classics, is an exciting affair, and has for its Elektra, Birgit Nilsson. Nilsson's approach to the role could be thought by some to be too overpowering, but there is no doubt the voice is in magnificent form. High Bs and Cs are met with absolute perfection, and the voice triumphantly rides above the orchestra when its needs to but one often feels that Nilsson lacks some of Borkh's colour, her palate being all too often Wagnerian in a role that, although dramatic, also requires subtlety. The Vienna Philharmonic are in glorious form for Solti, as they are for Sinopoli 30 years later. Sinopoli's Elektra bears all of the hallmarks of his great recording of Salome (possibly the finest ever recorded) - great transparency, an unnerving sense of a drama unfolding and a great rapport with his singers. Alessandra Marc is very fine in the title role, and absolutely compelling in her closing scene. What makes this recording so recommendable is the playing of the Vienna Philharmonic and the engineering. From a purely sound point this recording is thrilling - totally clear and allowing one to hear Strauss' opulence and dissonance as it might in the opera house. A wonderful, fully aural experience, as spectacular as any since CDs were first released. Both Solti's and Sinopoli's recordings appear at full price on Decca and Deutsche Gramophone respectively. The catalogue numbers are: 417 345-2 (Solti) and 453 429-2 (Sinopoli). Strauss' Elektra has been lucky in its interpreters and one hopes that 'live' recordings by Bruno Walter, Erich Kleiber and Sir Colin Davis might one day find their way onto disc to add to the discography of this greatest of twentieth century operas. Any ideal performance of Elektra requires a combination of great vocal singing and a masterfully rendered score. All of the versions listed above would make an ideal choice but the two versions that meet these criteria more than any other are Herbert von Karajan's 1964 Salzburg Festival performance and Carlos Kleiber's 1977 Covent Garden recording. In both, the transparency is marvellous - with both conductors at the very peak of their form - and both have thrillingly sung Elektras in Astrid Varnay and Birgit Nilsson. Inge Borkh's 1957 Salzburg Elektra with Dmitri Mitropoulos is narrowly preferable to her studio recording with Böhm, although that performance alone is worth acquiring for the superb playing of the Dresden Staatskapelle. Sinopoli is as exciting as Solti (whose advantage over all others is to present the score uncut) and has wonderful engineering to support his direction of the work. I cannot easily choose between Karajan and Kleiber, both of whom bring that something extra to this endlessly fascinating work. I must, therefore, recommend both. On-line slaes links have been made where possible. The Solti, Sinopoli, Beecham, Mitropoulos (Salzburg), Karajan (Salzburg) and the Bohm are all readily available from Tower or HMV. Both Salzburg recordings can be difficult to locate at times. The Schroder and Kleiber should be available from MDC's Opera music shop on the Strand, although the Kleiber is VERY hard to find. The Mitropoulos on Arkadia and the Mitropoulos on Fonit Cetra are both unavailable, although I recommend hunting for them on the following link:<http://musicfile.com/>Welcome to MusicFile: The Worlds Largest Collectible Music Store!